Home: It’s where my kids live. 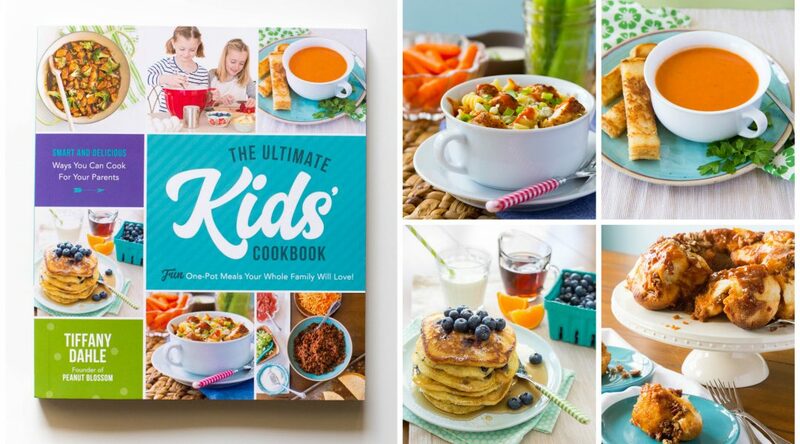 From the moment we got married, my husband and I bought home furnishings with future kids in mind and we considered how our purchases would function with little ones around. I chose distressed wood coffee tables over high sheen glossy surfaces so you’d never see the scratches. He picked a leather chair that would be easy to wipe spilled formula off. We both chose rounded corners on tables to avoid bumping tiny heads and busy patterned couches so stains would be less noticeable. My point is that these years spent with children living under our roof are the ones we’ve been waiting and wishing for. We are in the golden zone of our family and loving it. We want our house to represent exactly what it is — a young family with KIDS. We are not curating a museum of elegantly styled furniture, we are building a place we can all gather at the end of the day and feel like we each belong here. 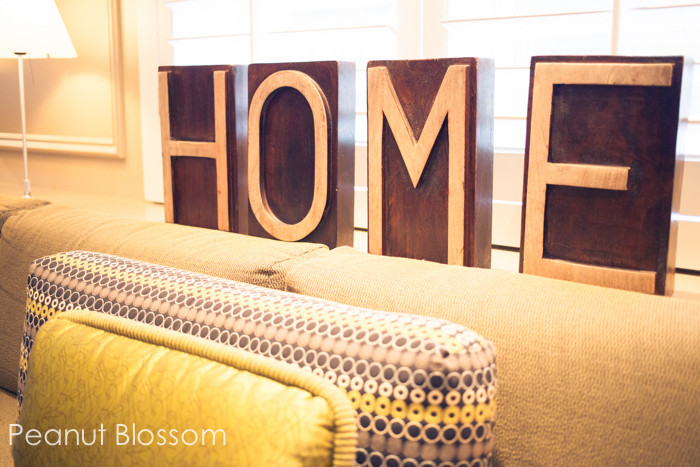 You don’t need to hide signs of childhood away, embrace them and incorporate them into your home! A perfect example of this is St. Jude Children’s Research Hospital. This clinical research facility is one of the warmest, most child-friendly spaces I have ever seen in my life. 1. 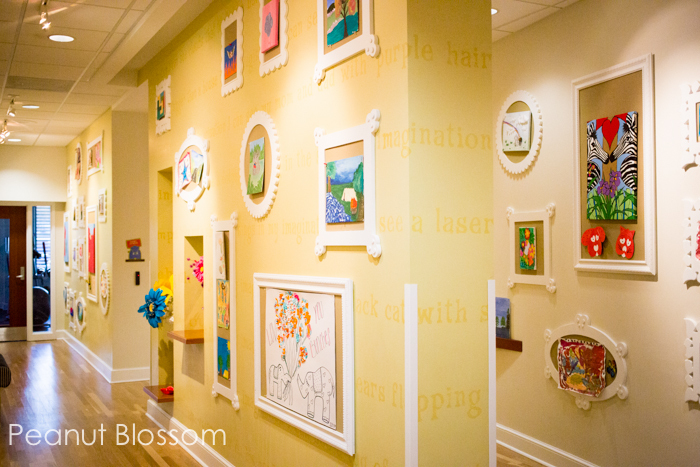 Display your child’s artwork: Build a rotating gallery for your kids. The Target House on St. Jude’s campus has a long hallway filled with various white picture frames filled with cork boards. 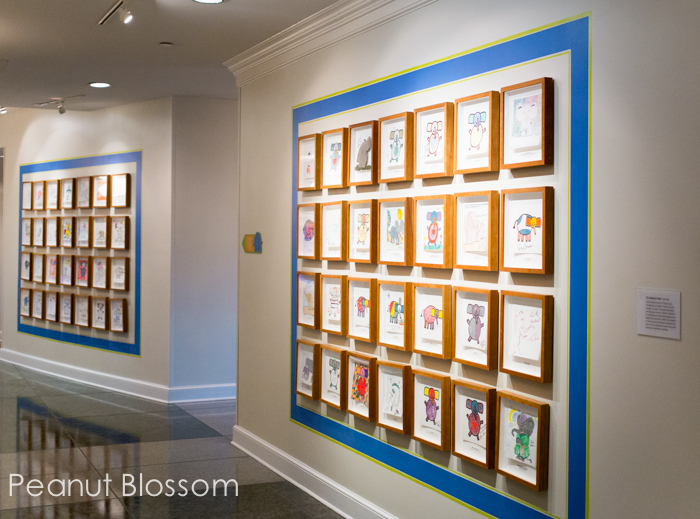 The current families submit artwork for this gallery and it changes with the seasons. I love that the frames are all different shapes, but the constant color unifies them. You could totally make your own affordable versions with this tutorial here. 2. Display whimsical art based on family favorite movies: Think outside the Renoir and display artwork from your family’s favorite movies. 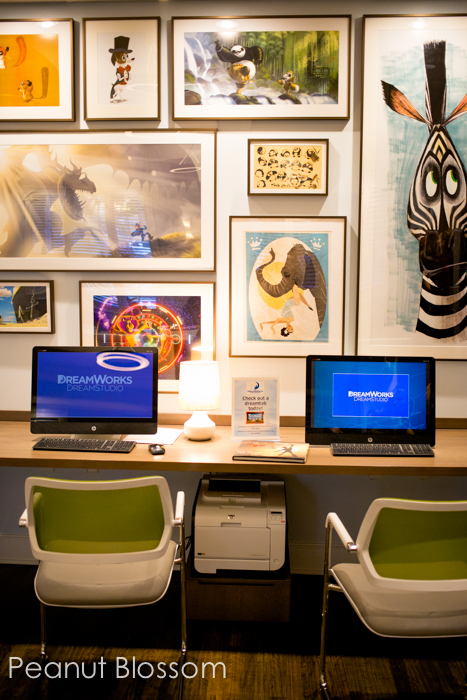 How fantastic are these inspired pieces from Dreamworks Studios that are featured in the media room at Target House?? They found unique pieces that go beyond movie stills or posters and are more like character portraits. 3. 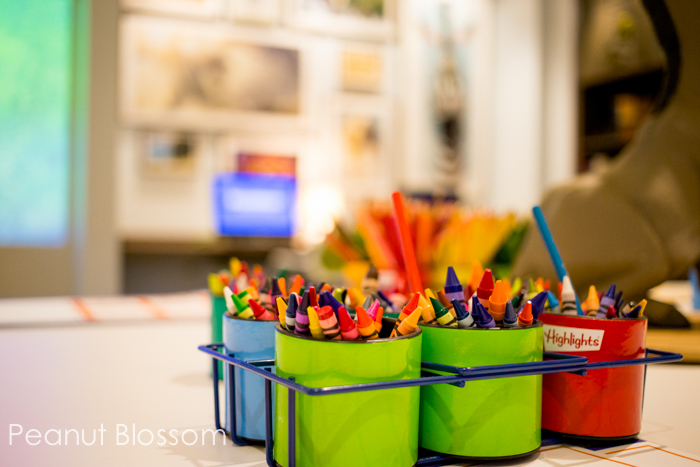 Corral art supplies into attractive containers: Find colorful accessories that match your overall decor and use them to store crayons, colored pencils, and pads of white paper. Leave them right out in your living room so they are handy when the mood strikes! 4. Consider functional uses for whimsical things: Our little red wagon takes my kids to the park. At St. Jude the little red wagons tote toddlers to treatment or down to Kay’s Kafe. We keep our play kitchen in the space where a dining table should go and it has been used far more for both fun and practical moments. Read more about my approach to using toys for function here. 5. The perfect paint palette: Children’s accessories are full of color. Balance it with a neutral scheme to make the colors pop. I love the warm earthy browns in this family gathering lounge at Target House. A crisp grey with white trim palette is also gorgeous if you prefer something cooler. 6. Represent each member of the family: Does your home reflect it’s inhabitants? I recently recognized that the only photos in our home were of our kids. I remedied it with a small gallery in our bedroom of pictures of just my husband and me. 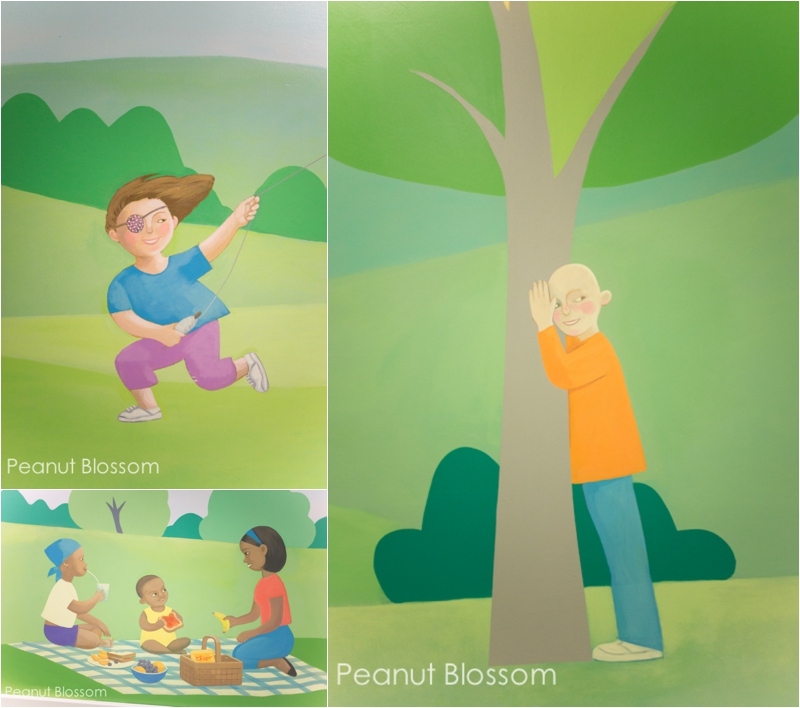 I loved that the murals in the halls of St. Jude featured representations of all the different kinds of kids and families housed under it’s roof. 7. Incorporate personality in your lighting: Accent lamps are a perfect place to add a touch of whimsy, they are easy to swap out later as your tastes change. 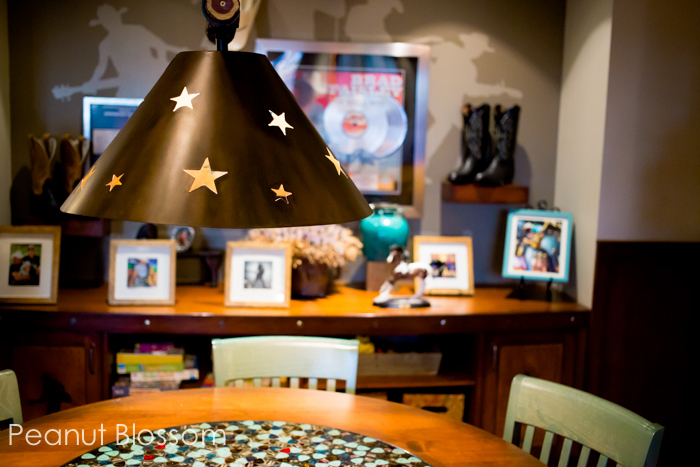 I loved this metal overhead lantern stamped with stars in the country-western themed room at Target House. I could easily see both my kids and my husband loving this style. 8. 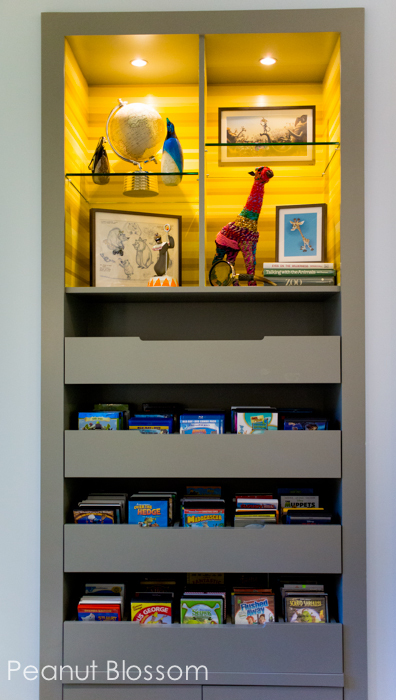 Choose storage pieces with little ones in mind: This media display cabinet is perfect for the movie-loving family. Everything is neatly gathered behind those drawers, but the titles face out just like a library. It is so easy for a little one to find their movie of choice, and even more importantly to put it back!! 9. 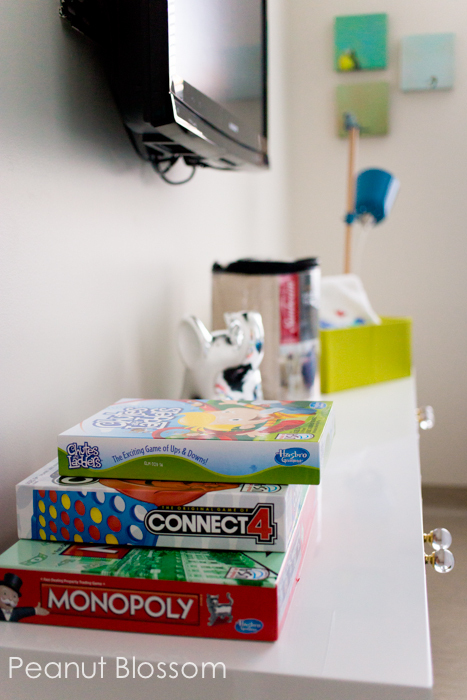 Hide games in your furniture: Whether it is stacks of your child’s favorites used as book ends on a shelf or a simple board of checkers stashed away in the living room, you’re more likely to reach for these family-friendly activities if they are in the spaces where you live and not stored away in the playroom closet. 10. 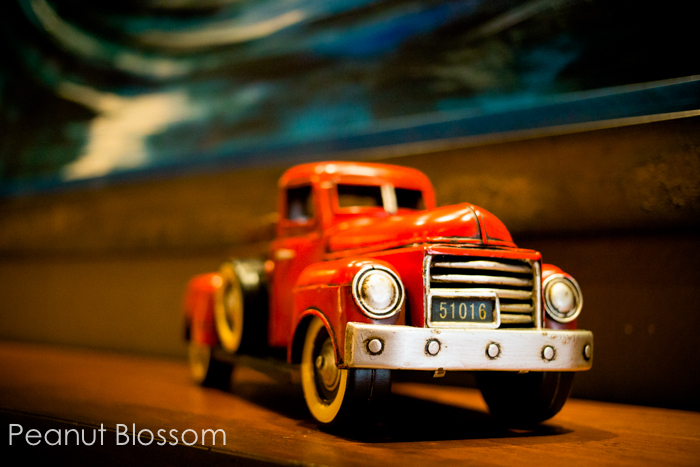 Use select toys as decorative accents: This adorable red truck stopped me in my tracks during our tour of Target House. If you were on the watch for details, you’d find dozens of hidden ones that just blended into the living spaces that together said, “Children live here” and made the whole space feel warmer and more comforting. Rather than buying a random knickknack at the store, use your kids outgrown favorites for adding personality on your mantle and bookshelf. Cancer is part of their lives, not their whole life. At St. Jude, life goes on and is celebrated every day. The entire staff at St. Jude strives to find ways to give their patients as normal of a childhood as possible. School work continues, sports and music lessons go on, holidays are recognized, proms and graduations happen each spring, Christmas is so awesome it happens twice! 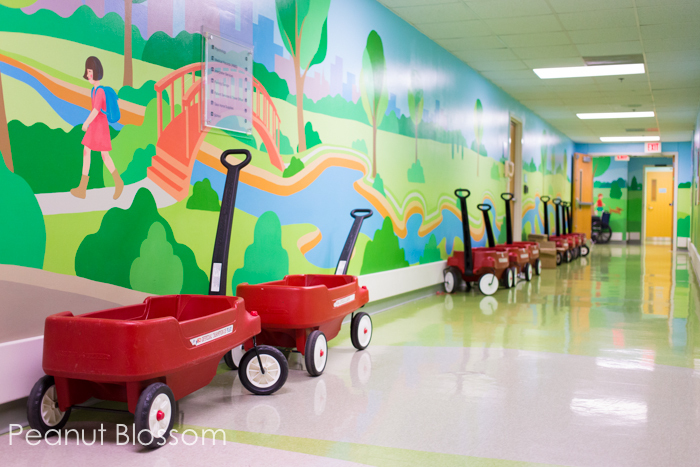 Everywhere you look you see signs of childhood in progress, right down to the little red wagons lining the halls. And if you ever needed more justification to shop at Target, let me tell you that Target House at St. Jude’s is breathtaking. 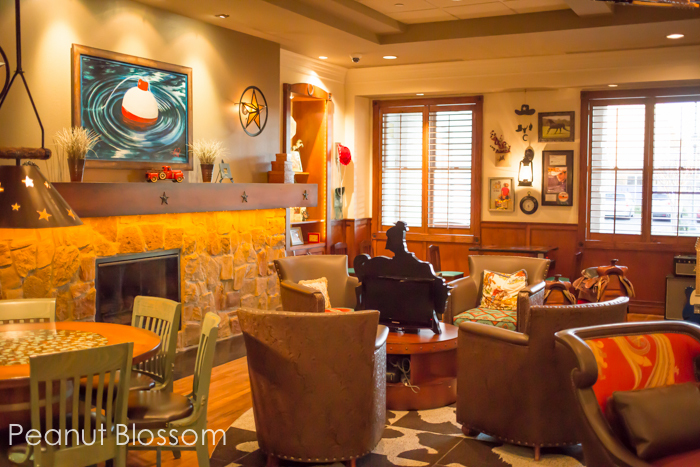 This longterm residence houses families seeking treatment at St. Jude for up to 3 years. Donations from people like you mean that no family has to pay a single penny to stay at this amazing home and they are free to focus on saving their child from cancer. 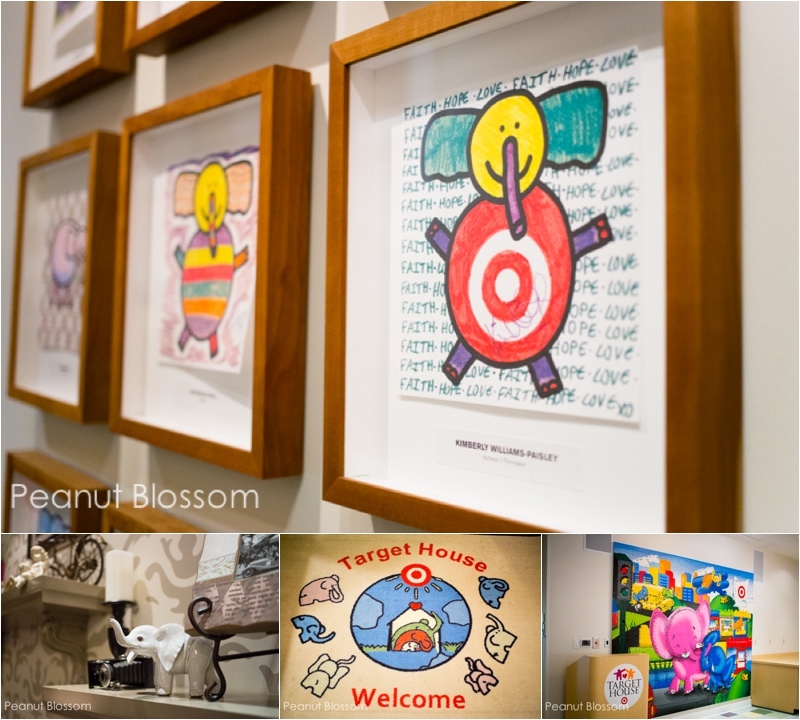 The symbol of Target House is the elephant because they are loyal family-centered creatures that stick together. Each family is provided a private living space but their apartments circle around the central community rooms where they can all gather together like a family. I loved how they incorporated elephants into the many nooks and crannies throughout the building. If you would like to support St. Jude’s battle against childhood cancer and help ensure that no parent has to worry about anything but saving their child, please consider donating to their cause here. We are running for St. Jude in just 3 weeks and I would love to meet our goal! Peanut Blossom is proud to be a St. Jude Blogger. I was invited to tour their beautiful campus in Memphis so that I could witness firsthand the amazing work they are doing to end childhood cancer and spread the word with you. All thoughts and opinions are my own. You may view our full disclosure here. I never knew how much having kids would affect my house! Most days if my husband gets the kids and gets home before me it is an absolute train wreck! Having an organized way to account for all of their toys is essential!! A super lovely post. It is wonderful to see how St Jude’s keeps life – living comfortably and happily – central to children’s lives. St. Jude’s is a wonderful organization and I am happy to support them! I didn’t realize that Target was such a big supporter. What an amazing thing to not have to worry about a place to live when your child is in the hospital! You are absolutely right, Emily! Thank you so much for pointing that out. I’m sorry I neglected to share that piece of information since it was truly one of the most inspiring things about the tour. It is amazing all the things that St. Jude has taken on in their research! Sending a big hug to you and your son. We live in such small space that it’s hard not to include the kids everywhere! I love this!! I’ve known I wanted my kids incorporated into our home decor but besides our fridge being covered in artwork, I was still trying to think of ways. This post totally gave me the inspiratioin I needed! I’m sure your very popular and honestly I really like your page but honestly there are so many ads on it I would avoid coming back.